(Tricontinental) – The mood in Caracas (Venezuela) is sombre. It appears that the attempted coup against the government that began on 23 January is now substantially over (as the Venezuelan Foreign Minister Jorge Arreaza tells me). The Lima Cartel is divided. The Europeans have cold feet. On the one-month anniversary of that attempt, a massive crowd of the poor gathered in the centre of Caracas to demonstrate their support for the Bolivarian Revolution. 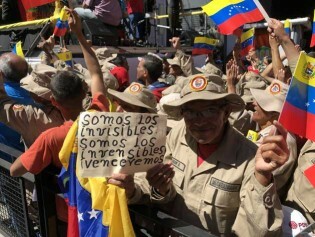 An elderly couple carried a sign which captured the mood – Somos los Invisibles. Somos los Invensibles. Venceremos (We are the Invisible. We are the Invincible. We will Overcome). (Tricontinental) – As the United States and its allies put pressure on Venezuela, a poem by the Salvadoran radical Roque Dalton (1935-1975) clarifies the structure of politics in Latin America. Dalton came from one of Latin America’s smallest countries, El Salvador, which he used to call the little finger (pulgarcito). A deeply compassionate poet, Dalton was also a militant of the People’s Revolutionary Army, whose internal struggles claimed his short life. El Salvador, like so many other Latin American states, struggles to carve out its sovereignty from the tentacles of US power. That hideous Monroe Doctrine (1823) seemed to give the US the presumption that it has power over the entire hemisphere; ‘our backyard’ being the colloquial phrase. People like Dalton fought to end that assumption. They wanted their countries to be governed by and for their own people – an elementary part of the idea of democracy. It has been a hard struggle. (Tricontinental) – On 15 September 1970, US President Richard Nixon and National Security Advisor Henry Kissinger authorised the US government to do everything possible to undermine the incoming government of the socialist president of Chile, Salvador Allende. Nixon and Kissinger, according to the notes kept by CIA Director Richard Helms, wanted to ‘make the economy scream’ in Chile; they were ‘not concerned [about the] risks involved’. War was acceptable to them as long as Allende’s government was removed from power. The CIA started Project FUBELT, with $10 million as a first instalment to begin the covert destabilisation of the country. (Tricontinental) - In June 1931, the Italian Communist Antonio Gramsci wrote a letter to Giulia Schucht, who lived in Moscow and with whom he had two children. One of the children – Delio – had taken an interest in literature, with a particular fascination for fantasy literature. This gave Gramsci, locked in a fascist prison, the opportunity to recall a story from his village on the island of Sardinia. Over two days – 8 and 9 January – over 160 million workers went on strike in India. This has been one of the largest general strikes in the world. The workers, exhausted by almost three decades of neo-liberal policies and by the attack on the rights of workers, came onto the streets to make their case for better livelihood and workplace democracy. Blockades on train tracks and on national highways closed down sections of the country. In Bengaluru, Information Technology (IT) workers joined the strike, while in Himachal Pradesh – see the picture above from the town of Hamirpur – workers gathered to demand an end to precarious employment in government service. Workers from a broad range of sectors, from industrial workers to health care workers, joined the strike. There has been no response from the government. Please read my report on the strike. We Are Sorry For The Inconvenience, But This Is A Revolution. On 1 January, 5.5 million women formed a 620-kilometre wall across the length of the Indian state of Kerala (population 35 million). This was not like Donald Trump’s wall across the US-Mexico border, a wall of inhumanity and toxicity. The wall of these women was a wall for freedom, a wall against traditions whose purpose is to humiliate. Addis Ababa, Ethiopia, 2013. It is past midnight. The aircraft come in from Saudi Arabia carrying workers who had been hastily ejected. They had gone from Ethiopia to work in a variety of jobs in a Kingdom flush with oil wealth.